Any Indian citizen over the age of 18 as on January 1 of any caste, religion or gender can vote. You are eligible to vote only if your name appears in the Voter List. 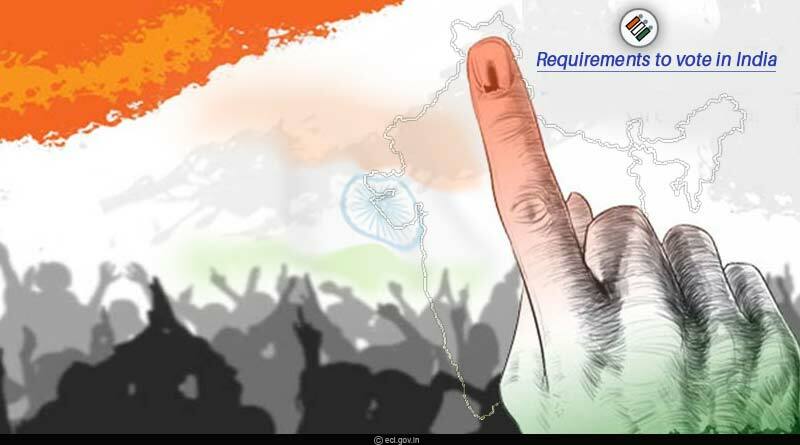 Any person of unsound mind or have been declared so by the court or disqualified due to ‘Corrupt Practices’ are not qualified to vote in the electoral rolls. If your name is not already in the voter list, you can get your name added by filling up Form-6 and submitting it at the Electoral Office of your Assembly Constituency. You can check whether your name is listed in the voter list or not online or through SMS. Just SMS <ECI> space <EPIC No> and send it to 1950 (EPIC stands for Electors Photo Identity Card, generally referred to as Voter ID card). Sign up to obtain a username and password and upload one passport size color photo in the given space. Mention the proof of residence and age. In case you are unable to upload, the Booth Level Officer (BLO) may also collect the documents from your place. Polling booth location can also be received by SMS. Send <ECIPS> space <EPIC No> to 1950. One Polling official will check your name on the voter list and verify your ID proof. The other official will put ink on your finger. At the next desk, you will be given a slip and sign on a register. The official at the last desk will deposit the slip, check your inked finger and then you will go to the polling booth. Record your vote by pressing the ballot button in front of the candidate of your choice on the EVM machine. You will hear a beep sound. A slip with your chosen Candidate Name, serial number and Symbol will appear in the transparent window of the VVPAT machine. The slip drops in the sealed VVPAT box after 7 seconds. If you do not want to vote for anyone, press the NOTA button, which means None of the Above. If you want to know more about voting, please visit ecisveep.nic.in. India Lok Sabha elections 2019 are scheduled to be held from 11th April 2019 till 23rd May 2019 in seven phases. You can check dates for your constituency here. The results of Election 2019 will be announced on 23rd May. For more articles like ‘Requirements to vote in India’, do follow us on Facebook, Twitter, and Instagram.